"Apple Computer Inc. said 'less than one-tenth of 1 percent' of its new iPod nano digital music players have defective screens and will be replaced for free. The iPod is Apple's fastest-selling product. "A 'vendor-quality issue' with the nano caused some screens to crack, Apple spokesman Steve Dowling said in a phone interview. The problem is 'not a design issue,' he said. Cupertino, California-based Apple released the latest version of the iPod on Sept. 7." 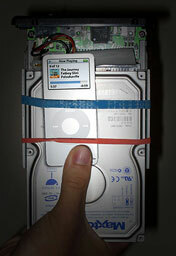 Uncyclopedia has posted do-it-yourself instructions for "upgrading" your iPod nano to 200 GB capacity - that's 150,000 songs! Be forewarned that doing this will so void your warranty! Also, battery life drops from 8+ hours to about 6 minutes with this hack. "When Apple Computer CEO Steve Jobs introduced the iPod nano on September 7, he predicted that it would be the best-selling iPod model ever. "That is a strong statement, considering that the nano is only Apple's second device to incorporate flash memory instead of a hard drive. It is an even stronger endorsement of flash-based technology, from a company that, until this year, declined to use it in a single product. "Jobs' newfound enthusiasm for the memory format indicates the extent to which the digital-music industry has pinned its hopes for mass-market appeal on flash-based players. Although hard-drive and micro-hard-drive devices have dominated the MP3 player market, flash-memory performance, price and popularity are all improving at such a clip that some analysts believe that it will overtake the hard drive in the very near future." "It's coming closer and closer to when my car is coming. The bad problem is the date gets farther and farther away every time I ask about it. It started with sometime in September to now being pushed to the 19th of October. Now that that date cannot be changed, I hope, I am back into looking for what I will do with my stereo system. "Back in August some time I was saying I would get the Clarion VRX755VD. It's a terribly awesome system but I have learned I won't be able to utilize that screen the way I would like. One reason is every time I change gears I won't be able to see the screen and that ruins a big point of having it in the first place." "Apple provides a single updater for all iPod models. The 'universal' updater installs the latest software appropriate for your iPod. For example, the 'iPod Updater 2005-09-23' will install the latest iPod software available as of September 23th, 2005. The latest iPod Updater can be downloaded from http://www.apple.com/ipod/download/." "First off: Apple responds to iPod nano screen concerns. Yay! Apparently there was a screen problem with a small number of nanos. Apple is fixing those nanos. Good for Apple for doing the right thing. Also, Derrick Story appears to be psychic, when earlier he said 'It almost sounds like there are two types of nano screens out there . . . possibly from two different vendors supplying them to Apple?' Good going Derrick. "So, you have a black nano and now realize that you should have purchased a case or a cover for it. But, it's too late now, it's already covered with barely visible scratches and marks that you can only see under a 500-watt lamp. Oh no! What will you do? Never fear, I put my nano at risk for your sake. I had read on Slashdot and a few other places that Brasso can restore an iPod to like-new condition, but I didn't believe it myself, and I was a bit worried that it would have some sort of bad reaction with my iPod, such as melting it. :) After all, a $4 can of Brasso can't compete with $20+ third party creams and polishes, can it? Read on…." 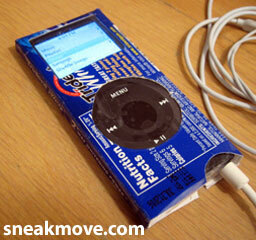 sneakmove.com has posted a do it yourself iPod nano case template. "The new iPod nano is amazing but what a pity that cases are still unavailable [uh... not any more CM] amid reports of scratch-sensitive screens we propose a solution: take matters into your own hands and make your own nano case. download the nano template and print it out. following instructions, cut on solid lines and fold on dotted ones. "You can probably do better, so feel free to tweak template (.ai illustrator format)-mix, modify, improve. send the files and pics (sneakmove at gmail) of your achievements and we'll put 'em online." "Not all computers have USB 2.0 ports. If the computer has USB 1.1 ports, you can use the iPod nano or iPod shuffle on these computers. If you have an iPod that can transfer files via FireWire, consider using the FireWire port (if available) and an iPod Dock Connector to FireWire Cable [instead of the much slower USB 1.1]. "A low-powered USB connection (such as a keyboard or bus-powered hub) will not work with iPod." Make sure that your computer meets the system requirements for iPod shuffle. In some cases, simply updating your versions of iTunes and iPod Software may resolve your issue. Visit the iPod shuffle Support page if you have questions about using iPod shuffle or need help with an issue. For usage help, check out the new iPod shuffle Tutorials, which feature step-by-step instructions to get the most out of your music player, and the 'Learn more' section. If you have an issue, view the 'Top Support' topics on the same page for troubleshooting steps that may resolve your issue without service. "If you've checked all of the items above and still haven't resolved your issue, review the topics below and try the relevant steps." Learn about iPod mini and where to get more information. "This document will help you determine the model of iPod you have as well as the latest version of iPod software available for your model. To ensure that your Mac or PC is compatible, check the system requirements for your particular iPod. "You can always download the latest iPod software at http://www.apple.com/ipod/download/." PR: SmartDeck allows you to control your iPod using the built in controls of your cassette player. 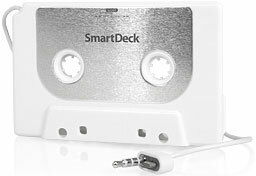 Using patent-pending sensing technology, the SmartDeck determines which commands the cassette player sends to the iPod. SmartDeck is more than just a cassette adapter for iPod; it achieves truly seamless integration between iPod and cassette deck. Use the cassette deck's forward and rewind buttons to advance to the next or prior songs in the iPod playlist. Pause and stop buttons do what pause and stop buttons are expected to do. Hit the cassette deck's Eject button or switch from Cassette to Radio, and Griffin's SmartPlay technology automatically pauses the iPod. Clear, high quality audio and iPod control together in one brainy cassette adapter. What more could you ask for? PR: iKitty is cute and functional - offering great rubberized protection, docking capability, and screen protection for your iPod or iPod photo. 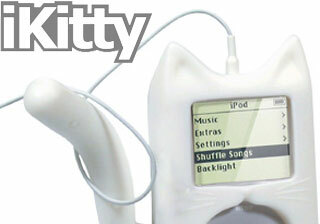 Insert iPod thru iKitty's 'docking flap'. Pull bottom part around your iPod- bend tail into desired position. Insert screen protector pegs into slots so it 'floats' above the screen. Meow? Dockable- 'sits' and hangs out while your iPod charges and synchs up! 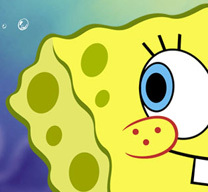 PR: XtremeMac has announced that it has entered into licensing agreements with entertainment companies including Warner Bros. Consumer Products, Twentieth Century Fox, Nickelodeon and Viacom Consumer Products, Lucasfilm Ltd., and Major League Baseball Properties to create iPod accessories featuring popular movie and cartoon characters as well as team artwork. This move marks the first concerted effort by any iPod accessory manufacturer to enter into the business of licensed consumer products. The new line of iPod cases, covers and armbands will be rolled out over the next several months, coinciding with the start of the holiday shopping season. Although specific details were not yet announced, XtremeMac noted that the products will be available through mass retailers and specialty electronics outlets as well as through the XtremeMac website and through retailers including The Apple Store and XtremeMac's network of resellers and distributors. PR: One year after The Cult of Mac wowed devotees of all things Apple, The Cult of iPod (No Starch Press, November '05) takes a loving look at how Apple's portable player has changed music, culture, and listening behavior for fans around the world. This new title from best-selling Cult of Mac author Leander Kahney includes the exclusive back story of the iPod's development, looks at the many ways iPod users pay homage to their devices, and investigates the quirkier aspects of iPod culture. Since its first iPod model hit the market in 2001, Apple has sold more than 21 million iPods, from the no-frills Shuffle up to the flagship 60 GB iPod. The Cult of iPod, like its predecessor, takes readers on a tour of everything iPod with gorgeous four-color photos, stylish layout and design, and tales of users who devote considerable time, energy, and imagination to their gadgets. Meet the little-known practice of iPod-jacking (strangers plugging into each other's iPods to find new music); discover the growing legions of MP3Js (regular folks who use their iPods to become DJs); and meet average Joes who create their own professional quality iPod commercials just for fun. The Cult of iPod looks at the cottage industries that have sprung up to capitalize on the iPod's popularity, too, from both fun and functional accessories to services that build customized playlists or will convert your entire CD library into the iTunes format. The Cult of iPod also covers the trend of celebrities and fashion mavens who've customized their iPods and made high-end limited edition carrying cases, as well as gadget freaks who've modded their iPods into one-of-a-kind designs that make techies drool. "The iPod gives both Mac and Windows users a common object for their adoration. Even people who don't own an iPod have heard about podcasting, and they certainly have those 'dancing silhouette' ads tattooed on their brains," said Bill Pollock, founder of No Starch Press. "Given the success of 'The Cult of Mac' and the world's obsession with the iPod, we figure we can score a few books from the ravenous iPod freaks." Like its predecessor, The Cult of iPod has a striking cover image and innovative design that would impress Steve Jobs himself. It also includes hundreds of photos and graphics that illustrate the many aspects of the iPod and its admirers. PR: Digital Lifestyle Outfitters (DLO), makers of the popular iBoom Boombox and other exciting accessories for the iPod, have announced that their TransPod All-in-one Car Solution for iPod works perfectly with the new iPod nano. 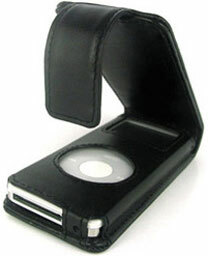 DLO's included fit pads combined with the iPod mini insert create a snug fit for either the white or black iPod nano. A TransPod Fit Kit for iPod nano that includes detailed instructions for fitting an iPod nano into the TransPod is available for download. The TransPod for iPod, iPod mini and now iPod nano is available at most major electronics retailers nationwide for $99.99. "Many other iPod car solutions were out of luck when the iPod nano was announced. The DLO TransPod, because it was designed to take full advantage of the line-out and power charging capabilities of the bottom connector, works just fine with the beautiful tiny new iPod nanos. We even have TransPods in white or black to match the nano perfectly," said Brian Baucom, Director of Marketing at DLO. The DLO TransPod is the home for your iPod in your car, and it performs beautifully with the new iPod nano. It works with all current iPods - so the whole family has one simple solution for enjoying their iPods of any size in the car. 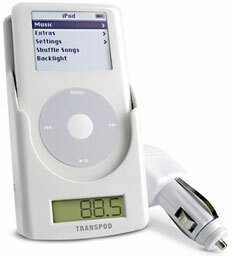 The TransPod comes with an insert and extra pads that can be fit for a perfect fit for the iPod nano. The DLO TransPod's "Fit Kit" is a downloadable .pdf template that instructs a customer on how to assemble the fit pads with the included insert for their iPod nano. Pricing and Availability: The DLO TransPod for iPod, iPod mini, and iPod nano costs $99.99 and is available online from DLO and at major retailers nationwide. PR: TuneTag Edge is a dog-tag style silicone case for iPod nano. 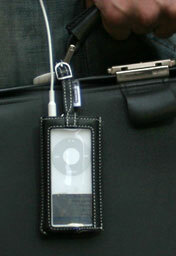 TuneTag Edge comes with a removable ball-bearing style chain so that you can attach your iPod nano to a belt loop or bag strap etc. Also you can use your own strap (not included) to hang TuneTag Edge around your neck. Compared to traditional silicone cases, TuneTag Edge uses The same high density silicone as IceWear which allows scratch protection and a protective bumper around the edge of your iPod nano. Of course TuneTag Edge's design allows full access to the headphone jack, hold switch and click wheel as well as full view of the color screen. TuneTag Edge has also been designed so that you can dress it up with clean removing, wearable wrapper [PopTune for nano] (sold separately). PR: Think Different Store (1-800-iPod.com) is offering InvisibleShield, the super strong, full-body wrap that protects the iPod nano without masking its distinctive look and feel. Covering both front and back of the nano, InvisibleShield is built to last. Made from film originally designed to protect helicopter blades while spinning at hundreds of miles an hour, the clear wrap is designed to stay on under the roughest circumstances. It will not come off unless you take it off. A great technology should be protected, but not at the expense of price or style. 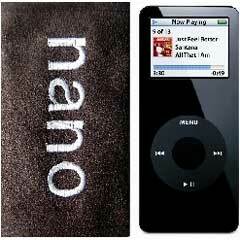 The difusi nano Valet has been specifically designed to offer unrivaled protection for your new iPod nano. You'll be amazed by the support of the ergonomic & unique form- fitting design that screams of style. The nanoValet is available in multiple color choices and features a limited Lifetime Warranty for worry free enjoyment. Connectivity has never been easier, the nanoValet offers Four (4) ways to carry your iPod nano. A carrying strap, Belt Clip, Belt Loop and a Solid Nickel Key ring clasp. All are included at no additional cost. Come in a choice of colors including red, lime, and black. High-quality spring loaded plastic belt or case clip. Options include Belt Loop, Solid Nickle Key Clip, Spring Clip. Preorder your nanoValet today and get at 40% off retail. 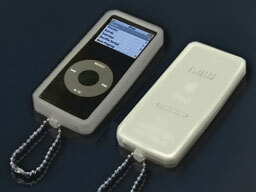 Designed to enable a snug yet easily removable protective carrying case for the iPod nano with easy access to all ports. PR: Get a grip on your iPod and keep it protected! The screen protector, belt clip, and custom-molded grippy shape gives you and your iPod the most value and protection for your hard-earned dollars. Get a grip! Get a GripSkin! Usage: Insert the spacer/belt clip plate (see included instructions) the right way for your size iPod. Insert iPod through the scroll wheel cutout and push up. Pull corners around bottom. Insert screen protector and attach belt clip if desired. Designed for the iPod shuffle and nano and compatible with other small MP3 players. High Quality Elastic for a firm and comfortable fit. Adjustable with Velcro to fit arms about 10" to 17". MP3Band-It with iPod nano - Designed for use with the Apple iPod shuffle and nano, the MP3Band-It is a simple, lightweight armband designed to securely hold your shuffle while you're on the go. The adjustable armband is made of very high quality and comfortable elastic and Velcro to fit most arm sizes, providing handsfree flexibility while you move and exercise. The new and perfect sized 1.25" width armband is now available in black and white for the iPod nano & iPod shuffle. PR: TuneTag is a luggage-tag style genuine leather case for iPod nano. TuneTag is made from smooth ultra high quality genuine nappa leather. There is a transparent vinyl sheet which covers and protects both the iPod screen and click wheel from dirt and scratching. This gives the face of the iPod nano complete protection from outside elements, yet still allows for perfect control of the click wheel and a full view of the screen. TuneTag also has a luggage-tag style belt strap which can be used to attach your iPod nano to the handle of your luggage, purse strap, bag or belt loop. PR: Super slim, stay-on tube with access to iPod nano hold switch, dock connector and headphone jack. Compatible with nano lanyard. Tube slides up or down to give easy access to click wheel and screen. Machine washable. Made from Wrappers' exclusive treated faux suede fabric designed to add scratch protection without adding bulk. Lined in super soft cream, faux suede (the same fabric used to line Italian leather gloves). PR: iPort, maker of the first in-wall music system for iPod, introduces five new free standing (FS) iPort music systems that let iPod owners stream audio and photos to their home entertainment system and sync with iTunes, switching between the functions at the touch of a button. Systems start at $150. iPort step up models offer expanded benefits including the ability to control volume directly from the iPort itself, as well as the ability to view the iPod's song, album, artist and playlist information on high-end touchscreen control systems. All FS systems are scheduled for release in the 4th quarter. "The elegant design of the free standing iPort, combined with the line's focus on user convenience, makes it the perfect choice for sharing music and photos with friends and family," said Peter Brown, iPort Vice President of Sales and Marketing. "By connecting the iPod to their existing entertainment system, users get a much better experience than from self contained docking systems with built in speakers." All iPort FS models charge the iPod when it's docked. Users drop their iPod into the iPort, enjoy music or photos, and always have their iPod ready to hit the road. And all iPort models have push button selectable syncing. There is no need to pick up your iPod once you drop it into the dock. Users switch between streaming and syncing with the touch of a button making it faster and easier to share content. Step up models provide all the features desired for high performance whole home systems. Integrated IR remote capability lets users sit back and control their iPod from across the room. iPort will offer a remote control, yet all iPod or programmable remote controls can also operate the iPort. Variable audio output allows the iPod to connect directly to an amplifier or powered speakers, with volume controlled from the iPort itself. Further upgrades make it easy to integrate the iPort into more sophisticated multi-room audio systems. These include: Balanced audio, which allows the iPort to be located as far as 500 feet away from the main stereo system; balanced video, which allows streaming of iPod photos to TVs or monitors up to 250 feet away; and two-way RS-232 communication, which allows users to see the iPod metadata (song title, album, artist, playlist, etc.) on touchscreen control panels that may be located in other rooms in the house. All five FS music systems include a multifunction two-part mated cable for USB, audio, video, control and power. The multifunction cable reduces clutter and simplifies connection. One side of the cable splits off for connection to the computer providing the means to sync the iPod to the iTunes library. The other side of the cable connects to a "breakout box" that provides outputs for audio and video along with inputs for power and control. The basic systems, FS-1 ($150) and FS-2 ($200), come packed with a simple mini-breakout box that provides audio outputs for standard RCA cable connection to a stereo and video outputs for both composite video and S-video cables for connection to any TV. An included power supply connects through the mini-breakout box and charges the iPod when docked. With the FS-1, the iPod is controlled manually through the iPod click wheel. The FS-2 adds integrated IR remote capability and variable audio output. The variable audio output is controlled from volume up/down buttons built into the iPort face, or remotely from an optional iPort remote control or from a host of third party iPod and universal audio/video remote controls. The iPort remote control, REM-1 ($50) will control all in wall and free standing iPort music systems equipped with an IR sensor and is due to ship at the same time as the FS music systems. The step up systems, FS-3, FS-4 and FS-5, include all the features of the FS-2, plus they are packed with an advanced breakout box designed for integrating the iPort into whole home distributed audio and video systems. The FS-3 ($600) features a balanced audio path that supports wiring runs up to 500 feet, as well as IR pass-through capability for operation from IR based control systems. Included with the FS-3 are the advanced breakout box and audio sender and receiver wall plates. The FS-4 ($800) is enabled for two-way communication. Users with RS-232 control systems can operate the iPod from any room or even outside and see the track, playlist, album and artist information just as if the iPod were right in front of them. Two-way control is as easy to use as the iPod itself. Completing the line is the FS-5 ($1,100), which builds on the FS-4 adding balanced video sender and receiver wall plates, allowing users to send images on their iPod photo devices up to 250 feet for viewing on any TV or video device. Said Brown, "The iPort in-wall systems with two-way communication capabilities set a standard for iPod integration. With our free standing systems ability to stream and sync, and switch between them at the touch of a button, we've pushed the convenience envelope even further." PR: Spice up your night life with Party-Pod Pro! What's New In Version 5.0-X ?